The city of Ann Arbor now has a plan in place to use sharpshooters to cull 100-deer this winter. In this week's 'Issues of the Environment' WEMU's David Fair Fair talks to Ann Arbor Mayor Christopher Taylor about the emotional decision to use lethal methods. Additionally, they discuss the environmental impacts of deer overpopulation and the city's environmental agenda, moving forward. 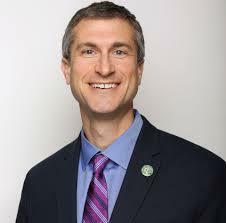 * Ann Arbor Mayor, Christopher Taylor, campaigned on a platform that included support for the environmental initiatives of former Mayor John Hieftje, and he took office in November of 2014. * Mayor Taylor continues to support the objectives of Ann Arbor’s Sustainability Framework and Climate Action Plan, and his intentions include: protecting drinking water, fostering renewable energy programs, improving mass transit, expanding the PACE program, increasing density in the city, walkable neighborhoods, and improving environmental disparities in the city between wealthy and poorer residents. * Ann Arbor City Council has approved a plan to use lethal methods to take out 100-deer this winter to combat a local issue with overpopulation of the animals. Mayor Taylor was the only member of Ann Arbor's governing body to vote "no."